Let us provide you with a free, no obligation estimate. We will develop a customized pre-move plan at no additional charge. We offer the same excellent service for all of our customers. No job is too large or too small. We complete each job with a thorough post-move walkthrough. Fully owned and operated fleet of well –maintained vehicles and equipment. We cover all of Virginia and the Metro DC area and beyond. We have provided our clients with services throughout the states. We can provide crews around the clock to meet your specific needs. Our fully trained, experienced crews will professionally pack and relocate your employees, furniture and equipment in an efficient process to assure little to no down time, whether it’s across town or just down the hall. OIVA specializes in reconfigurations. Let us assess your current layout and prepare a space plan that will work for your current or future needs. We have successfully relocated hundreds of thousands of confidential records for industries as diverse as the financial, medical, legal, and manufacturing sectors. We have the expertise and experience to keep your records organized the way you like them. 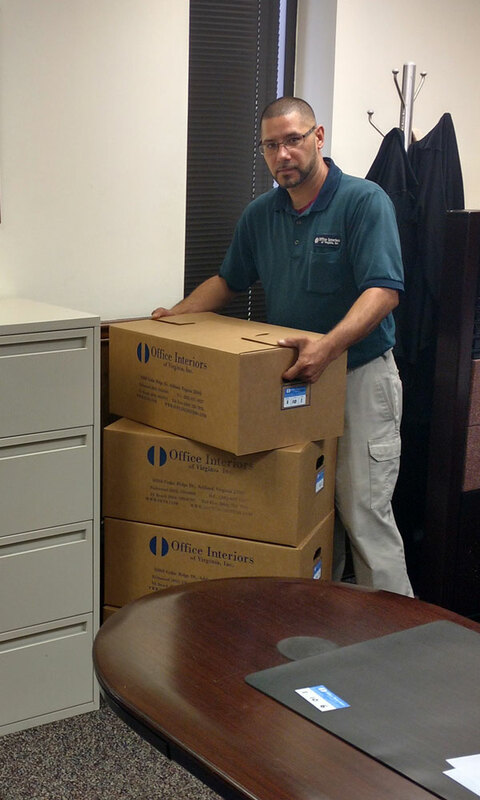 At Office Interiors of Virginia, we are experts in the moving of high density filing systems. We have experience moving and reinstalling fixed shelving, mobile shelving and Lektrievers and Power Files. At Office Interiors of Virginia, we are experts in the moving of all types of libraries. Our experienced movers can help move your library and we can even provide you with temporary storage and staging areas to help you transition to your new facilities.